I do not customarily offer advice to a president whose election I opposed, whose goals I fear, and whose policies I work against. But here is an idea for Barack Obama to salvage his tottering administration by taking a step that protects the United States and its allies. 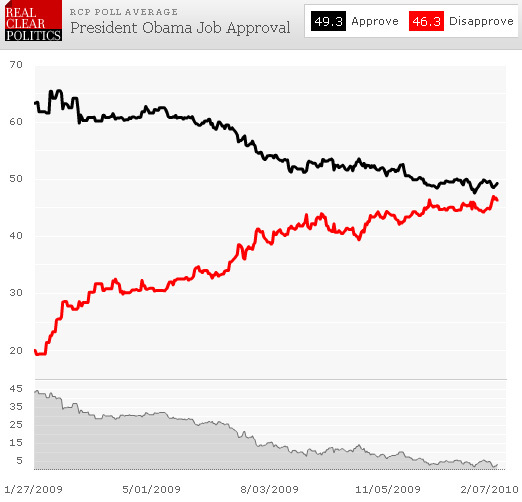 If Obama's personality, identity, and celebrity captivated a majority of the American electorate in 2008, those qualities proved ruefully deficient in 2009 for governing. He failed to deliver on employment and health care, he failed in foreign policy forays small (e.g., landing the 2016 Olympics) and large (relations with China and Japan). His counterterrorism record barely passes the laugh test. This poor performance has caused an unprecedented collapse in the polls and the loss of three major by-elections, culminating two weeks ago in an astonishing senatorial defeat in Massachusetts. Obama's attempts to "reset" his presidency will likely fail if he focuses on economics, where he is just one of many players. He needs a dramatic gesture to change the public perception of him as a lightweight, bumbling ideologue, preferably in an arena where the stakes are high, where he can take charge, and where he can trump expectations. Such an opportunity does exist: Obama can give orders for the U.S. military to destroy the Iranian nuclear weapon capacity. Circumstances are propitious. First, U.S. intelligence agencies have reversed their preposterous 2007 National Intelligence Estimate, the one that claimed with "high confidence" that Tehran had "halted its nuclear weapons program," No one (other than the Iranian rulers and their agents) denies that the regime is rushing headlong to build a large nuclear arsenal. Second, if the apocalyptic-minded leaders in Tehran get the Bomb, they render the Middle East a yet more volatile and dangerous. They might deploy these weapons in the region, leading to massive death and destruction. Eventually, they could launch an electro-magnetic pulse attack on the United States, utterly devastating the country. By eliminating the Iranian nuclear threat, Obama protects the homeland and sends a message to American's friends and enemies. Third, polling shows longstanding American backing for an attack on the Iranian nuclear infrastructure. Los Angeles Times/Bloomberg, January 2006: 57 percent of Americans favor military intervention if Tehran pursues a program that could enable it to build nuclear arms. Zogby International, October 2007: 52 percent of likely voters support a U.S. military strike to prevent Iran from building a nuclear weapon; 29 percent oppose such a step. McLaughlin & Associates, May 2009: asked whether they would support "Using the [U.S.] military to attack and destroy the facilities in Iran which are necessary to produce a nuclear weapon," 58 percent of 600 likely voters supported the use of force and 30 percent opposed it. Fox News, September 2009: asked "Do you support or oppose the United States taking military action to keep Iran from getting nuclear weapons?" 61 percent of 900 registered voters supported military action and 28 opposed it. Pew Research Center, October 2009: asked which is more important, "To prevent Iran from developing nuclear weapons, even if it means taking military action" or "To avoid a military conflict with Iran, even if it means they may develop nuclear weapons," Out of 1,500 respondents, 61 percent favored the first reply and 24 percent the second. The nuclear facility at Qum on Sep. 26,2009 from 423 miles in space, provided by GeoEye. Not only does a strong majority – 57, 52, 58, 61, and 61 percent – already favor using force but after a strike Americans will presumably rally around the flag, jumping that number much higher. 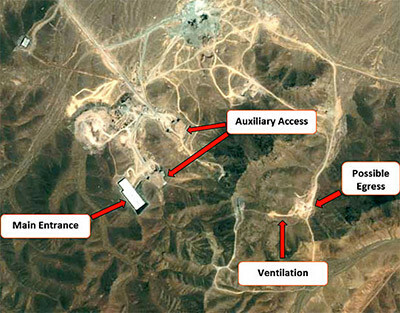 Fourth, were the U.S. strike limited to taking out the Iranian nuclear facilities, and not aspire to regime change, it would require few "boots on the ground" and entail relatively few casualties, making an attack politically more palatable. Just as 9/11 caused voters to forget George W. Bush's meandering early months, a strike on Iranian facilities would dispatch Obama's feckless first year down the memory hole and transform the domestic political scene. It would sideline health care, prompt Republicans to work with Democrats, make netroots squeal, independents reconsider, and conservatives swoon. But the chance to do good and do well is fleeting. As the Iranians improve their defenses and approach weaponization, the window of opportunity is closing. The time to act is now or, on Obama's watch, the world will soon become a much more dangerous place. Feb. 2, 2010 updates: (1) Of all people, Washington Post columnist Richard Cohen today substantiates my comment about Obama's counterterrorism record barely passing the laugh test, at " Obama administration is tone-deaf to concerns about terrorism." (2) Did I mention netroots squealing? Well, they did not wait for a U.S. attack on Iranian nuclear facilities - they began right on cue with the publication of this article today. For some examples, here's a screenshot of Google News. The netroot squeal starts, right on cue. Feb. 8, 2010 update: I survey the responses on Left and Right to this article at "Sarah Palin Endorses 'Bomb Iran'." 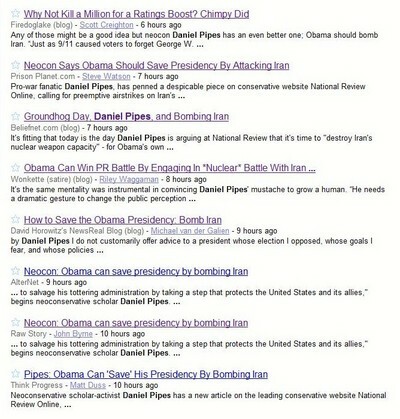 Feb. 15, 2010 update: Today I document "Further Reactions to My 'Bomb Iran' Argument," and they are indeed interesting. June 27, 2013 update: I repeat this argument in a new context at "Obama to Save Presidency by Bombing Iran? Round Two."